Size 72" x 35" x 60"
Bunk Bed in Powder Coated Pipe Frame. Completely Knock Down type design. Easy to assemble. Bed size is 72" x 35" x 60". 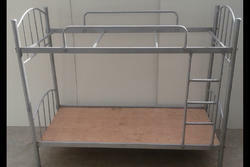 Looking for Metal Bunk Bed ?